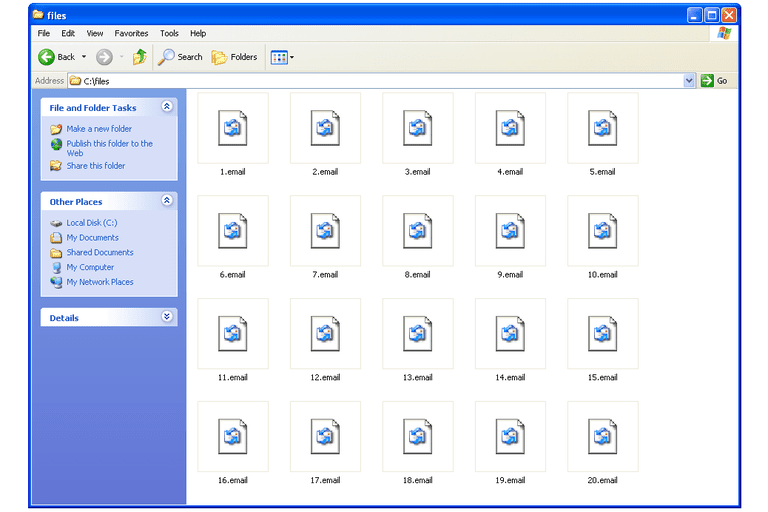 A file with the EMAIL file extension is an Outlook Express Email Message file. It includes not only the message of the email but also any file attachments that were included when the email was received by Outlook Express. It's possible that an .EMAIL file is associated with an old AOL mail program, too. EMAIL files are rarely seen these days because newer email clients use other file formats to store messages in, like EML/EMLX or MSG. EMAIL files can be opened by Windows Live Mail, part of the old, free Windows Essentials suite. An older version of this program, Microsoft Outlook Express, will also open EMAIL files. This Windows Essential suite has been discontinued by Microsoft but can still be found in some places. Digiex is one example of a website where you can download Windows Essentials 2012. If you're having troubles opening the EMAIL file, try renaming it to use the .EML file extension instead. Most modern email programs only recognize email files that end with the .EML file extension even though they might support EMAIL files, too, so changing the file from using the .EMAIL suffix to .EML should let the program open it. Another way you might be able to open an EMAIL file is with an online file viewer like the one at encryptomatic. However, it only supports EML and MSG files, so you should first rename the EMAIL file to use the .EML file extension and then upload the EML file to that website. Renaming a file's extension like this does not actually convert it to a different format. If renaming the extension works, it's because the program or website can recognize both formats but only lets you open the file if it's using a specific file extension (.EML in this case). You can open an EMAIL file without Outlook Express or Windows Live Mail by using a free text editor. Opening the EMAIL file in a text editor lets you view the file as a text document, which is helpful if the majority of the email is saved in plain text and you don't need access to the file attachment(s). If you find that an application on your PC does try to open the EMAIL file but it's the wrong application or if you would rather have another installed program open EMAIL files, see our How to Change the Default Program for a Specific File Extension guide for making that change in Windows. Though we haven't tried it ourselves, you might be able to convert an EMAIL file with Zamzar. However, since it doesn't support this old EMAIL format, rename it to *.EML first. Zamzar can convert EML files to DOC, HTML, PDF, JPG, TXT, and other formats. It's also possible that the email programs above can convert the EMAIL file to a new format but it's likely that they only support EML and HTML. If your EMAIL file doesn't open properly, remember that a file with the .EMAIL file extension is not just any generic "email file" that you get when downloading emails to your computer through any email program. Although an "email file" and ".EMAIL file" look similar, not all email files are .EMAIL files. Most email files (i.e. files you download through an email client) are not .EMAIL files because the format is used only in older MS email clients that most people don't use anymore. Modern email programs use email file formats like EML/EMLX and MSG.